First they unplugged your phone from the wall, rolled it up and stuffed it in your pocket. Then they took your camera off the shelf, shaved it down to the thickness of a playing card and slid that inside the phone. They crammed in your Walkman too. Your address book and appointments diary. Pager, torch, pedometer, radio, dictaphone, bookshelf, TV, PC, satnav, even your wallet now. In short, just about any piece of equipment you might want to carry around in your pocket finds itself inexorably sucked into the single über-device we still, for want of decision, call a phone. There is a good one-word explanation for this: Synergy. All these functions share at least some and often many requirements – a visual interface perhaps, network connectivity, speakers, data storage, computational power of course. The user benefits greatly by not having to carry multiple versions of essentially the same hardware. Imagine how we’d rattle if we did. It wouldn’t be worth the effort or expense to make most of these things pocket-sized. Make them a function of a universal gadget however, and the synergies flow. The one that really clinches it though is power. At first it may seem counter-intuitive to put all our electric eggs in one battery basket. When one goes flat, they all go. But consider the alternative: If all these things needed charging separately there would be one or more plugged in pretty much all the time, completely undermining mobility. The greatest synergy of all is that you can charge everything at once. In many respects what we’re really carrying around is a fantastic little power source with some peripherals attached to it. With this in mind, it’s easy to understand why smart watches have never really taken off. They cannot as yet replace the smartphone, and carrying both means you duplicate many functions while adding few. Yet they have to be charged as often as phones or more, doubling your inconvenience for very little palpable benefit. While you might embrace one enthusiastically as the badge of an early adopter, it won’t be so long before you find you forgot to charge it. The simple fact is, you don’t need a smartwatch. To ever be more than an expensive optional accessory to the smartphone, the smartwatch has to turn the smartphone into its optional accessory. Note the word optional. The market-redefining smartwatch will have to do all the indispensable communication things – texts, emails, social media updates and, last but still not least, voice calls. But unlike the current Apple offering, it needs to do it without an attached smartphone. Otherwise it’s really more of a burden than a blessing. The smartwatch will be successful when it’s the one device you always want to bring with you. Your wrist is the natural place for that. This will not mean the end for the unit we still call the phone. We’re unlikely to abandon such a convenient, multifunctional device while it still has irreducible advantages: A far larger screen interface, room for more and better sensors, more data, and of course much more energy. But we can reimagine the phone now. Specifically we can imagine it… without the phone. If your watch can receive your calls and data, then the “phone” no longer has to be an always-on device. It can be more like a small tablet, used for apps, browsing, media and other roles that benefit hugely by the larger screen and greater processing power. But like a tablet it only needs to be powered up when you actually want to do those things, putting it in the class of devices with battery life measured not in hours but in days. And this introduces a very interesting possibility: it could act as a power bank to the watch. You’d worry a lot less about running out of juice on the road if your communication device could be topped up from its energy-rich companion. That’s not just a synergy, it’s symbiosis. And this is not the only opportunity offered by taking the phone out of the phone. The limitations on the dimensions of your pocket device have always been dictated by its phone functions. Giants like the Galaxy Note 4 or iPhone 6 Plus push at the limits of what most people can comfortably use one-handed. Go much larger, and you cross the boundary of what fits into pockets. Shifting the communication function to the watch though means you no longer really need its companion to a be go-everywhere compromise. It can, literally and figuratively, be whatever your pocket allows. You could even have more than one of them – a slim one for tight pants and a big one for a bag, anything from a born-again flip phone to a workhorse device with a pen or keyboard. 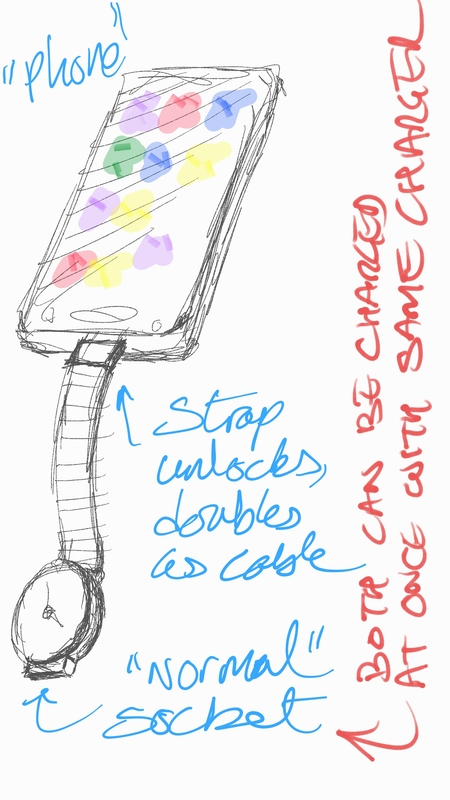 What the phone will evolve into is a set of optional extensions for your wristwatch. These may reproduce some of its functions and add others, but their essential purpose is to allow you to choose the best interface for the way you want to interact with it. All this awaits the creation of a smartwatch that really is usable for voice calls and data, yet has battery life to last comfortably through the day. It’s a tall technological order, and the (first) Apple Watch certainly doesn’t achieve it. What it may achieve though – indeed, perhaps what only Apple can achieve – is an end to our culture’s resistance against talking into your wrist like a cartoon character. That alone would be a great stride toward the next mobile revolution.